KafkaZkClient is a higher-level Kafka-specific ZooKeeper client. 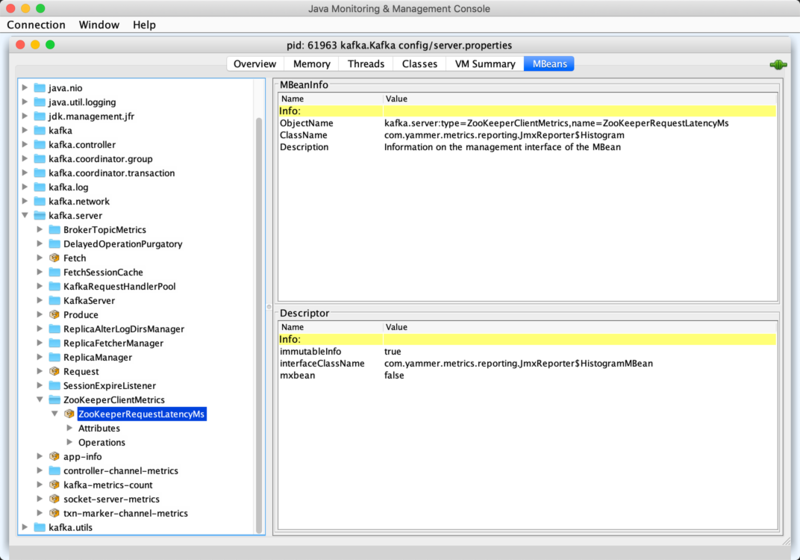 KafkaZkClient is a KafkaMetricsGroup and registers performance metrics. The performance metrics are registered in kafka.server:type=ZooKeeperClientMetrics group. Enable DEBUG logging level for kafka.zk.KafkaZkClient logger to see what happens inside. KafkaZkClient initializes the internal registries and counters. apply creates a ZooKeeperClient that is then used to create a KafkaZkClient. getAllBrokersInCluster fetches broker IDs followed by fetching the metadata of every broker (which is the data associated with a /brokers/ids/[brokerId] znode). getTopicPartitionStates getTopicPartitionStatesRaw for the given TopicPartitions. For every response, getTopicPartitionStates decodes the JSON-encoded partition state data (for the partitions that were found in ZooKeeper). getTopicPartitionStates is used when KafkaController is requested to updateLeaderAndIsrCache, areReplicasInIsr, updateLeaderEpoch and process a PartitionReassignmentIsrChange controller event. registerControllerAndIncrementControllerEpoch is used exclusively when KafkaController is requested to elect. createSequentialPersistentPath is used when KafkaZkClient is requested to propagateLogDirEvent and propagateIsrChanges. propagateLogDirEvent is used exclusively when ReplicaManager is requested to handleLogDirFailure. propagateIsrChanges is used exclusively when ReplicaManager is requested to maybePropagateIsrChanges. getTopicPartitionStatesRaw creates a ZooKeeper GetDataRequest for the path /brokers/topics/[topic]/partitions/[partition]/state for every partition in the given partitions. In the end, getTopicPartitionStatesRaw retryRequestsUntilConnected the GetDataRequests. getSortedBrokerList gets the child znodes at /brokers/ids path and sorts it by broker ID (according to the natural ordering).